Only have time for a mini-moon or short honeymoon? Here are eight romantic ideas for things to do on a UK mini-moon that are right on our doorstep. With a log fire, wood-beamed walls, vintage slipper bath for two and rose garden, luxury holiday cottage, Moorland View, is one of the UK’s most romantic places to stay for a mini-moon or short honeymoon. Ok, so it’s not actually a castle, but what Bovey Castle lacks in heritage, it makes up for with fabulous facilities and sweeping views. Set on a private sporting estate just up the river from Moorland View, this luxury hotel has an 18-hole championship golf course, indoor swimming pool, tennis courts, fly-fishing lake, croquet lawn and archery arena. 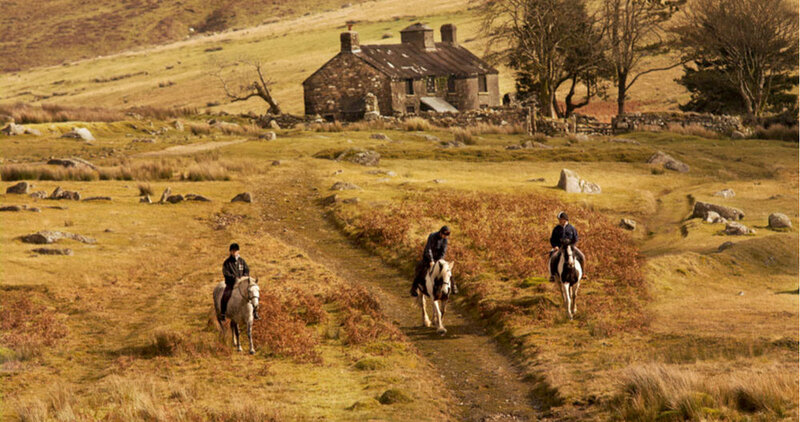 Huge stone fireplaces, soaring ceilings, ornate panelling, squishy sofas and terraces with epic views make it one of the grandest destinations on Dartmoor to whirl away a lazy afternoon on your mini-moon. As a guest of Moorland View, you have complimentary membership, with up to 25% off spa treatments, food and drink. The 20-minute walk from the cottage along the river, across old stone bridges and through woodlands, is beautiful. There’s no better way to blow away the cobwebs on a UK mini-moon than with a drive across the high moor. Our most romantic scenic drive takes in epic moorland, pretty thatched hamlets and the remains of a Bronze Age village. Our last idea for your UK mini-moon is to go stargazing. With clear, dark nights, Dartmoor is a fantastic place to view the night sky, with the Milky Way often clearly visible. Grab a picnic rug from the cottage, a torch, blanket and bottle of wine and head to the top of Hound Tor, one of the most atmospheric and easily accessible spots to stargaze. You’ll find full details in the cottage. Planning on popping the question? Here are the best places in Devon to propose - from secluded coves and mountain tops, to vineyards and stately homes. Our guide to the best things to do on a romantic break in Devon - from beautiful beaches and dramatic peaks, to cosy pubs and glamorous restaurants. Planning a UK mini-moon? Here are eight romantic ideas for things to do on a short honeymoon break in Devon.